Skip the oven and the processed snacks with this homemade granola bar recipe. 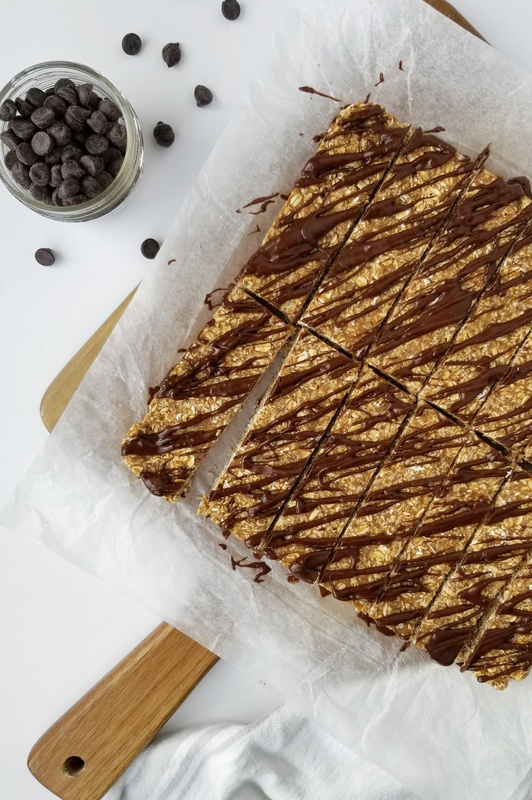 Made with clean, nutrient-dense ingredients, you will love snacking on this guilt-free bar. They’re easy and fast to whip up and are created with easy to find ingredients (…that you likely already have in your pantry). Store these in the refrigerator up to one week or in the freezer for as long as you like! One at a time, add the wet ingredients and mix well to combine. It should have a sticky consistency that holds its form when pressed between your fingers (Note – if it is crumbling, try adding water 1 tbsp at a time OR peanut butter 1 tbsp at a time). Line a square pan with parchment paper and transfer the bar mixture to the pan. Press down until evenly distributed and filling the corners. Place in the freezer to harden. Combine topping ingredients in a small microwave-safe bowl and melt at 15-second increments, until chocolate is melted. Remove the pan from the freezer and lift the bars out using the parchment paper. Drizzle with the melted chocolate and peanut butter mixture (Note – you will not need to use all of this). Return to freezer until the topping hardens. When ready, use a large knife to cut into 14 bars. These can be stored up to 1-week in the refrigerator or 1-month in the freezer. Enjoy! Low-Calorie Substitute: Instead of regular peanut butter, use 1 1/4 cup powdered peanut butter and water, as needed, for consistency.